An estimated 550,000 people have lined the streets of London to watch the 21st anniversary New Year's Day Parade, organisers have said. More than 10,000 performers from various nations were believed to have taken part in the two-mile procession from Parliament Square to Piccadilly. Performers include marching bands, dancing troupes, and carnival queens. Temporary grandstands were erected along Whitehall, Lower Regent Street and Piccadilly for the parade. Asian pipers, Russian dancers, riders on penny-farthing cycles, miniature steam engines, a Hindu Scottish pipe band and a parade of donkeys were among the performers and participants in the parade. They were firstly led by motorbikes from the Goldwing Owners Club of Britain, and then by the Fort Myers High School Marching Band from Florida, a 117-strong band who successfully fought a ban preventing them from playing in London because of terror fears. The band raised £260,00 ($500,000) to travel to London to perform in the parade after their parents voted to veto the ban which was imposed following the July 7 bombings. Dan Kirkby, spokesman for the parade, said: "I think it is an absolute triumph. The numbers of people and the quality of the parade this year have been fantastic. "It has been a wonderful event, and it is giving London the best possible start to 2007. It is being seen by people in dozens and dozens of countries around the world, and it is a platform for London to show off what it can offer." The Mayors for each of the 33 London Boroughs were also expected to attend. 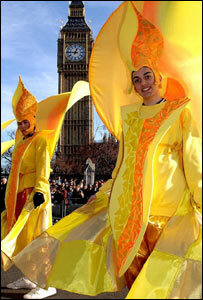 The parade begun at 1200 GMT at Parliament Square. The Queen sent her warm best wishes, which were read out by Roger Bramble, the Deputy Lieutenant of Greater London, as the New Year's Day Parade kicked off. It headed down Whitehall to Trafalgar Square, then headed into Cockspur Street and Pall Mall, up Lower Regent Street to Piccadilly Circus and then left along Piccadilly itself. All these roads were closed for the parade abut were expected to be open again by 1700 GMT. The New Year's Day parade is a free family event.